Want to set up your wireless router, but don’t know where to start? You’re not alone. The assortment of cables, ports, and other components stashed in your router leaves most people scratching their heads. Every router is different, and the specific steps for setting them up depend on your model. In most cases, the easiest thing to do is to follow the instructions that come with the device. But if you can’t find those instructions, or just don’t understand them, these general steps should help. They apply to most routers on the market today, and can also help if you’re trying to set up a used router. This tutorial assumes you’re setting up a router to be the primary router in your home. We’re going to assume you have a modem — be it cable, fiber, or DSL — that is already set up and working properly. Finally, we’re going to assume you have a laptop with an Ethernet port, though a desktop computer that’s near your router could also work. With these caveats in mind, let’s get started. Don’t plug your router into the power outlet just yet. Instead, the first thing you’re going to do is connect your modem to the WAN port, with an Ethernet cable. Not sure what the WAN port is? Most consumer routers feature five Ethernet ports, four of which are called the LAN ports (local area network) and another called the WAN (wide area network) port. The WAN port looks the same as the LAN ports, but it’s often a different color and spaced apart from them. 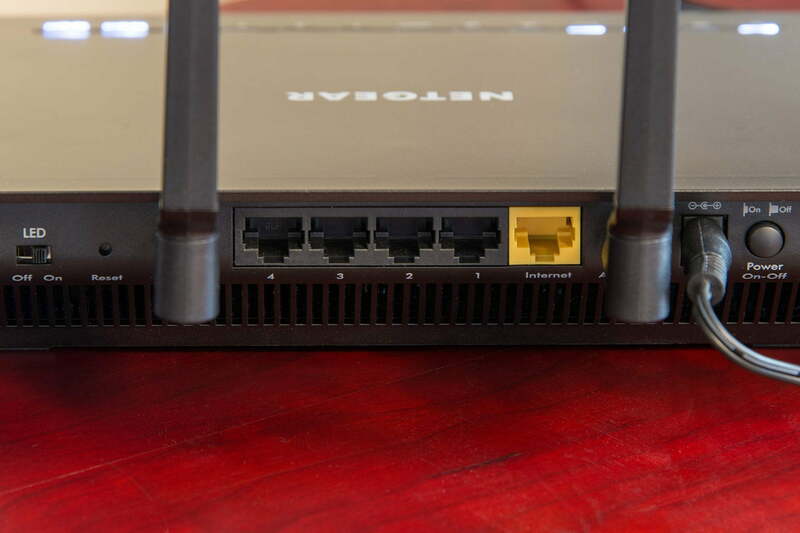 In the above photo, for instance, the WAN port is yellow and labeled “Internet.” Sometimes it will be labeled “WAN.” This port is intended to connect your router to the modem, and the outside world from there. The LAN ports are intended for connecting to local devices. Plug one Ethernet cable into your modem, and the other end into your router’s WAN port. Then plug another Ethernet cable into a LAN port, using it to connect your laptop. With that done, you can now plug your router’s power adapter into the wall. Your router may take a little bit of time to start up, but once it does, your laptop should be connected to a local network and the Internet. You can confirm this from the taskbar on your computer. In Windows, for example, you’ll find the networking icon located to the left of the clock. If you find a page, go ahead and jump ahead to the next step. If that address doesn’t work, however, your router may use another address entirely. This can vary depending on your router, so consult your router’s official documentation if the “192.168.1.1” address doesn’t work. Another possibility is opening the Command Prompt — accessible via the Start button — and typing “ipconfig” before hitting “Enter.” The default gateway is the address you’re looking for. Alternatively, you could just check our list of default router IP addresses and passwords. For most new routers, you’ll be asked to create an administrator username and password. Make sure this password is unique and secure, because anyone who has it can do all kinds of nasty things to your network. In some cases, you’ll be asked to enter the admin username and password. If you’re using a new router, there should be a sticker on the router or a piece of paper in the box that highlights the default username and password. If not, consult our list of default router passwords. Be sure to change the default later on. If the default usernames and password do not work, it’s likely that someone previously set up the router with a unique username and password, and that you need to reset it. How to do this varies from router to router, so consult your router’s official documentation if you can. Most routers, however, have a recessed reset button on the back. Holding down the “reset” button with a paperclip for at least 30 seconds will do the trick. Leave the power on, and wait for the router to rest. It should utilize the default settings when it restarts, meaning the default username and password will grant you access to the admin panel. Assuming you’ve managed to connect to your router’s admin page, you’re ready to configure your wireless settings. The settings here can be overwhelming, but let’s get to the thing you’re likely looking for: Wi-Fi. On most routers, there will be a section devoted to this. Sometimes it’s called “Wireless,” sometimes it’s called “Wi-Fi,” and sometimes it’s even called “Radio.” Head to this section and don’t get too caught up on the exact terminology. Here, you should see a box labelled “SSID.” This allows you to choose a name for your wireless network. Try to pick something unique, so it doesn’t overlap with your neighbor’s wireless network. Next, we need to set up the security settings. Use WPA2 security — anything else makes it too easy for hackers to access your network. Make sure you choose a long password, too, one that is distinct from the admin password you set earlier and ideally doesn’t include words from the dictionary or an easily guessed name (like the name of your pet). Afterwards, store it somewhere secure. With these steps out of the way, your router should be ready to use. Go ahead and connect your devices, and enjoy! Of course, there’s a lot more you can configure, if you dig into the settings. Setting up port forwarding can be useful, and the true power users should consider replacing their firmware with DD-WRT to get access to all kinds of settings that are otherwise not offered. For most users, however, working Wi-Fi and secure access to the administrative backend is a great place to start.